A new exhibition replicating letters and parcels sent to the front line in WWI by friends and family will be at Bishopston Library from October 16 until November 25. Parcels of Comfort includes textile parcels, appliqué, embroidery, printmaking and knitting. Did you know that in the First World War the British Army considered delivering letters and parcels to the Front as important as delivering rations and ammunition? All the sewing and knitting has been done by hand to create an empathy with that era. The subject has been carefully researched including using the names of real soldiers featured in the We Have Our Lives commemoration at Bristol Cathedral and in the book Letters From the Trenches by local author Jacqueline Wadsworth. 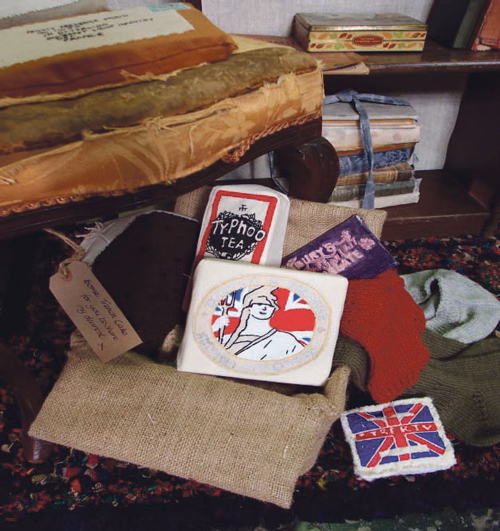 Bristol artists Sally Stanley, Paula New, Jane Marie-Mahy, Lucy Saunders and Jane Kay have used mixed media to recreate the atmosphere of the time, including knitting from original wartime patterns. In addition, GCSE Textile students from Cotham School have helped to represent some of the other items in the parcels.